Planning permission for this barn was sought prior to permitted developments for bran under class Q was available, however the same formula was adopted for the works. The building is not listed but was classed by the local authority as a non designated heritage asset and therefore the conservation of the existing buildings did need to be carefully considered. As a result the barn comprises of three structures. A timber frame barn which has been repaired and retained as a single space, an unusual feature for a barn conversion. A brick dairy which has required extensive repair and now houses 3 bedrooms with a bathroom and an en-suite. These two structures are linked by a contemporary barn structure replacing a pre-fabricated metal frame section of the barn. This is the centre of the house, with a 2 storey vaulted section, kitchen, and living space, with master suite above. 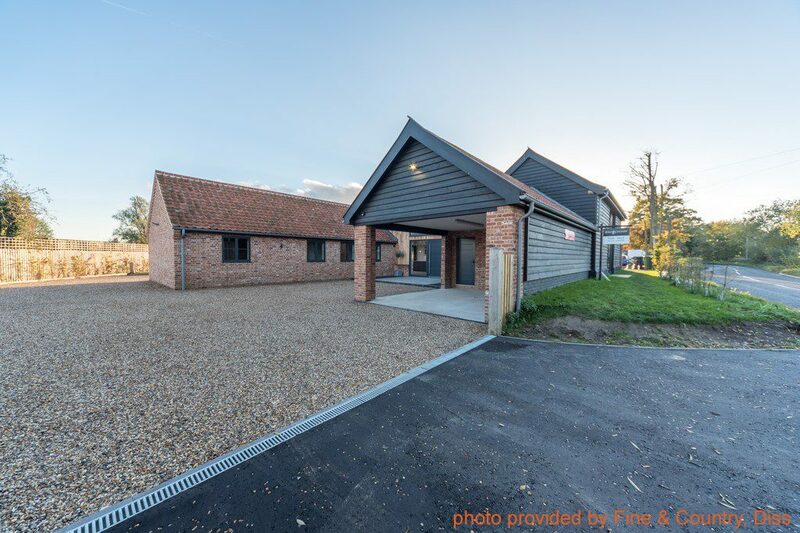 The design shows the 3 stages of the barn, with the timber frame structure, a Victorian dairy and now the contemporary styling of a barn linking them together. The result is large open plan spaces, with plenty of glass and views out across the countryside. Photos supplied by Fine & Country, Estate Agents.